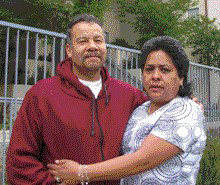 Ana Mendoza and Pedro Trujillo had lived in Los Angeles for 15 years. Ana talks about living in slum housing not too far from Temple Villas where she now lives with her husband and their four children. Her family of six were crammed into a run down and crumbling one bedroom apartment. Her children slept in the bedroom and she and her husband slept on a converted sofa in the living room. For 12 years this was their routine. Pedro was a carpenter and worked sporadically when work was available. Ana scraped by with food stamps, collecting cans, and making and selling tamales. But all of that together was not enough even to cover the cost of basic necessities. Then she heard about WORKS’ affordable housing developments through a relative. “I applied and hoped for the best.” She remembers just one question from her interview for the apartment: ‘Why do you want to live here?’ “The answer was simple to me; I wanted a better future for my children.” Her application was approved and her family moved into a four-bedroom apartment. “My children are now happier; they feel like they can do anything.” Her son’s grades improved from F’s to B’s. “I began to take more interest in my children’s education by attending parent-teacher conferences.” Her oldest daughter Brenda, 21, is now a registered nurse and her daughter Jacqueline, 18, is in college. Her son will be graduating from high school this year. Now, the youngest who is 9, looks up to his older siblings. Ana, Laura, Natalie… They couldn’t be more different in terms of personality, family composition, dreams and desires. Each has an unmistakable style all her own: Ana, the quiet, studious one; Natalie, the self assured, independent one; Laura, the lively, humorous one. But they shared a common bond: being the children of immigrants who faced daunting economic, educational, and personal struggles. By and large, their parents had received only minimal education, most dropping out after middle school. And all three girls lived at Highland Village. Before WORKS developed Highland Village, gang members, prostitutes, and drug dealers claimed the neighborhood as their own. Children walked through this dangerous scene day in and day out on their way to and from school. The road to a high school diploma seemed booby-trapped with all of the obstacles associated with neglected low-income communities—-teen pregnancy, soaring drop out rates, gang involvement, economic hardships, depression, and low self-esteem. Emboldened by the support and structure offered by WORKS in this renovated apartment community, families began to stand up for their beliefs and people took notice. The Community Center hummed with activity, offering a variety of programs including English as a Second Language, after school tutoring, and computer instruction at no cost to residents and neighbors of Highland Village. Almost six years later, the girls are now young women who have defied the odds. They all graduated from high school and are currently enrolled in or attending college. 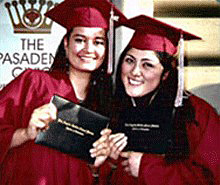 They beam with pride at being not only the first generation to graduate high school in their families, but also the first to attend college. They will surely not be the last.